jQuery DOM manipulation methods manipulate the DOM in some manner. The complete list of jQuery DOM manipulation methods can be found at the following link. jQuery attr method is used to set or retrieve attribute values of html elements. Example : In this example we have 2 DIV elements. Since attr() function retrieves only the attribute value of first matching element, we only get the title attribute value of the first DIV element. To retrieve the title attribute value of all the matching elements, jQuery each() method can be used. 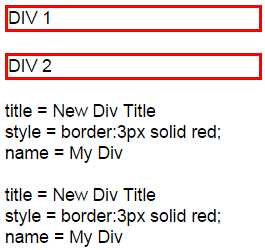 Sets the title attribute value of all the matching elements to "new div title"
Example : If you want to set the same value for the title attribute of all the elements, then there is no need to loop thru each element. 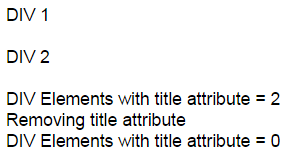 All the div elements in this case will have 'new div title' as the title attribute value. If you want to set a different value for the title attribute, then you may need to loop thru each element. Instead of creating a separate JSON object (config) and then passing it to attr() method, you can create the JSON object inline. How to remove an attribute using jQuery removeAttr() method : The following line of code removes title attribute of all the div elements that have a title attribute. Hi Venkat, you are a great teacher. i love your teaching methodology and I must say your text version and the slides on Jquery are great and huge improvement over previous recordings. Am soo happy we have teachers like you. Thanks for the juery tutorials. It has helped me a lot. Its just one thing I couldn't figure out that how auto suggestions come up in your VS while you type. Is there any extension..?? Reference jQuery file in your html.